As companies generate more and more data, one of the key things they need to do is find some way to make it all useful from a business standpoint. Business intelligence software has long been a way to help with that, and Amazon threw its hat into the ring with a service called QuickSight, provided through its Amazon Web Services division. It was announced at the company's AWS Re:Invent conference in Las Vegas. 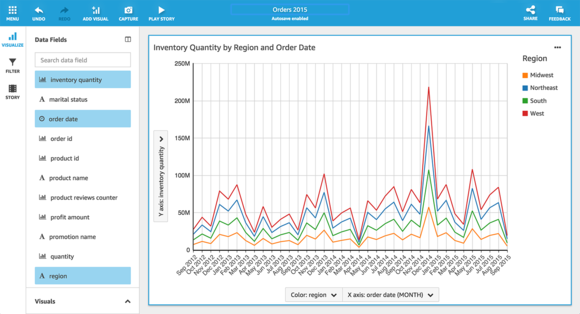 An example of AWS QuickSight's ability to graph data. The service will pull in all of the data businesses have stored in Amazon's cloud from sources including Redshift, DynamoDB, Elastic Map Reduce and even flat files that companies have stored in AWS's Simple Storage Service (S3). It also works with Salesforce, Oracle and files that users upload directly. The service will then generate graphs it thinks that users want, and suggest different variables that users should compare against one another. Once users have pulled up a visualization that they're interested in, they can then refine the data, and pull in other information into a single graph or chart. Once they have charts that they like, they can then share the interactive data with other people inside their company as a "storyboard." In addition to a Web interface for the service, Amazon also has native mobile apps for iOS and Android for viewing QuickSight on mobile. That's important for companies that have large tablet deployments, or those who just want to make sure that their employees are able to access business intelligence data on the go. It's all powered by a new query engine Amazon calls the Super-fast Parallel In-memory Computation Engine (SPICE), which is supposed to be faster to use than traditional engines, thanks to a combination of technology including columnar storage, data compression and machine code generation. The service comes in two flavors: a standard edition that costs $9 per user per month with an annual commitment, and an enterprise edition that costs $18 per user per month when companies commit to using it for a year. The enterprise edition offers additional features like support for Active Directory integration and encryption at rest. Amazon isn't the only major cloud provider with its own data visualization suite. Microsoft has been heavily pushing its own Power BI tool, which integrates with both its database services and third-party providers. Unveiling QuickSight also puts Amazon in competition with one of its neighbors and customers: Seattle-based Tableau Software, which runs its data visualization and business intelligence tool on AWS.